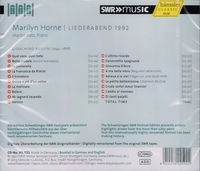 "Although Marilyn Horne was 58 years old at the time of this concert, she appears at the height of her abilities as an artist on this CD. Among the recordings over the course of Horne's career, there are many Rossini operas and this all-Rossini program shows that she could also convincingly dominate the smaller forms as well. Contains some previously unavailable recordings." "The Mezzo sopranos are not the leading ladies in opera, the soprano is, but American-born Marilyn Horne became as big a star as any dramatic soprano diva. Her career span the 60's, 70's and 80's, she sang in all the leading opera houses - The Met, Covent Garden, La Scala, etc., and was an artist who upheld the most consummate musicianship. Her voice was not as dark or deep as the voices of such mezzos as Giuletta Simionato, Fiorenza Cossotto, Grace Bumbry and Shirley Verrett. Hers was a voice that had a brassy, dramatic ring to it though she was clearly in her element as Rossini heroines- Neocle in SEMIRAMIDE, Rosina in BARBER OF SEVILLE, LA CENERENTOLA - and she sang Carmen and Adalgisa in NORMA opposite Joan Sutherland. She sang trouser roles like Cherubino. Not being in the spotlight was at first a struggle for Horne, but she overcame this by her dedication and sheer vocal artistry. Her voice is beautiful and BIG, a mezzo with lyric bravura and coloratura to boot. Marilyn Horne is still a very loved American singer."